Catie Noyes for Farm and Dairy: The world of digital agriculture is continuing to advance before our eyes, says John Fulton, associate professor in Ohio State’s College of Food Agriculture and Biological Engineering. “The fact is that people are all connected,” said Fulton, and it’s only a matter of time before farms are all connected as well. 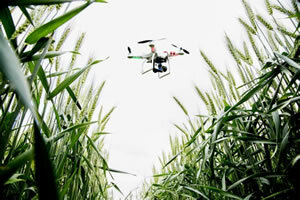 Fulton and Scott Shearer, chair of Ohio State’s College of Food Agriculture and Biological Engineering, share a glimpse of what’s on the horizon for precision agriculture. We’ve already gotten a peek into the future of autonomous machines with Case’s unveiling of their autonomous tractor at the Ohio State Farm Science Review in the fall of 2016. According to Scott Shearer, the potential is there. “If we can go to full autonomous, we could have someone sitting in an office controlling eight to 10 tractors,” he said. These tractors would be smaller, lightweight tractors that would reduce compaction and potentially increase yields by 5-10 percent, he said.